What sets Pao Xiang Bah Kut Teh apart from the ordinary, soupy type of Bah Kut Teh is our unique way of preparation of this delicacy. High quality blend of special herbs and spices are simmered for hours together with the right selection of meat to extract the wonderful aroma. During this arduous cooking process, the broth thickens. The final product is an excellent tasting high quality cut of meat with the correct texture in a thick, slow owing broth that one can only expect from Pao Xiang. The secret of the Pao Xiang experience lies in the limited amount of soup in every bowl that we serve. 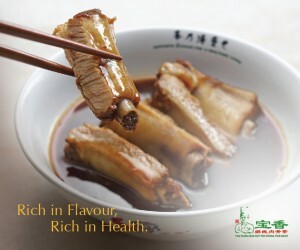 Whenever you are here, you can be assured of a rich and great tasting bowl of Pao Xiang Bah Kut Teh that keeps you yearning for more.